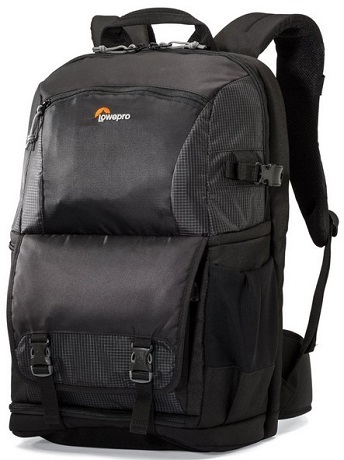 The Lowepro Fastpack BP 250 AW II Camera Case will hold all the gear you need while you are out and about. The main compartment has three adjustable dividers for a customizable storage solution. Convert into a sling bag and use the fast-access, side-entry pocket to quickly grab gear. Additional features: top pocket with five smaller pockets and key lanyard; front accessory pocket; built-in All Weather AW Cover; padded rear storage pocket; side pocket; side tripod strap; trolley straps; chest strap and removable waist belt. Fits: One DSLR camera with lens attached, 2-3 extra lenses, a flash, up to 15" laptop or tablet, tripod, plus accessories.